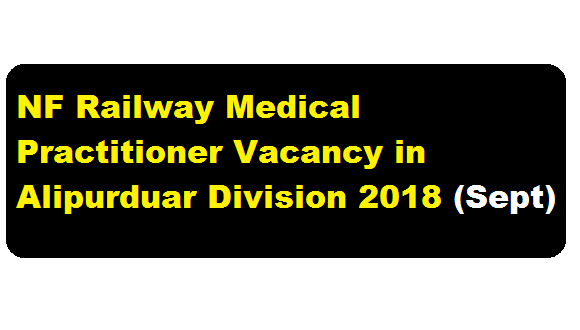 Northeast Frontier Railway Medical Practitioner Job in Alipurduar Division 2018 September :- NF Railway invites candidates for walk-in interview for the Engagement Of Medical Practitioner On Full Time Contract Basis On Aupurduar Division Of Northeast Frontier Railway. The details of the interview is shared below. Name of the post: Anesthesiologist. Job mode : Contract Medical Practitioner (Full Time). Date & Time of Interview: 27-09-2018 of 10.00 AM. Venue: Office of the Chief Medical Superintendent, Alipurduar N.F. Railway. (a)Specialists : The candidate should possess MBBS with Post Graduate Degree/Diploma in respective subject/field as a specialist and should be registered with Indian Medical Council. (b) General Duty: The candidate should possess MISES Degree and be registered viith Indian Medical Council. Age Limit: Candidate should not exceed 60 years (65 years for retired govt medical officers) of age as on 01.09.2018. Detailed notification is available at www.nfr.indianrailways.gov.in (general Info o departments personnel walk in interview). The willing eligible candidates should report for the “WALK-IN-INTERVIEW” as per date and time specified above with copies of all certificates/testimonials IN ORIGINAL and attested true copies and also two passport size photographs. In the event of any wrong information/ fake academic certificates/testimonials etc. the candidates will liable to be taken up under Govt. of India’s law in force.